The Boehs family has been involved in the construction industry since 1956 when Robert started as a construction helper. He together with his wife, Joan, raised 3 daughters and 2 sons. In 1976, Robert, along with his 2 sons, Doug and John, formed Boehs Construction and worked together until 1989. At that time, Robert bowed out of the day to day management, John moved to Nebraska to farm, and Doug continued in the business. Doug and his wife, Geneva have 4 children (Cory, Seth, Mahlon, and Jerilyn). All of these children grew up as associates in the business. Cory started Kool Foam spray foam insulation in 2007 and now provides the region with those services. Jerilyn married Darwin Giesel in 2013 and moved to Wisconsin. The family’s interest in building materials led them to make a “dream” a reality in 2002. 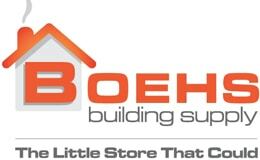 Boehs Building Supply entered the retail supply business working out of the construction business office. The first lumber warehouse was a 42’x64’ building built in 2003. By 2005, the building supply business had outgrown the construction office and a decision was made to build a 50×100 Hardware Store at 308 N Main in downtown Helena. In 2008, a 30×60 Hearth and Patio Room was added to the Hardware Store to display a variety of heating and grilling products. In 2009 a 94’x125’ warehouse was built to accommodate the growing need for more building materials. In 2012 Seth and Mahlon each bought 1/3 of the business from Doug and they became equal partners. In 2017 a 84’ x 150’ Hardware Store was built in Fairview and another location was added. The Boehs Building Supply team is ready, so come on by!